The twenty-second letter of the Hebrew alphabet. Its name is connected with "taw" = "sign" ( see Alphabet). 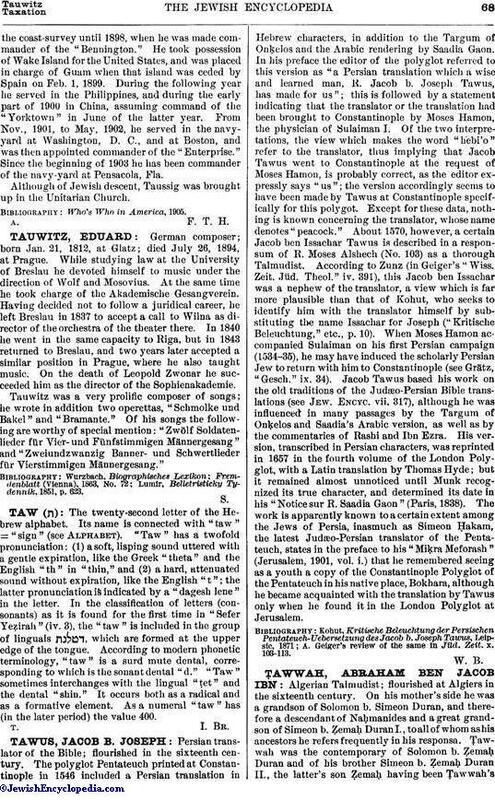 "Taw" has a twofold pronunciation: (1) a soft, lisping sound uttered with a gentle expiration, like the Greek "theta" and the English "th" in "thin," and (2) a hard, attenuated sound without expiration, like the English "t"; the latter pronunciation is indicated by a "dagesh lene" in the letter. In the classification of letters (consonants) as it is found for the first time in "Sefer Yeẓirah" (iv. 3), the "taw" is included in the group of linguals which are formed at the upper edge of the tongue. According to modern phonetic terminology, "taw" is a surd mute dental, corresponding to which is the sonant dental "d." "Taw" sometimes interchanges with the lingual "ṭet" and the dental "shin." It occurs both as a radical and as a formative element. As a numeral "taw" has (in the later period) the value 400.